The environment of corporate world is ever changing. No business operates in a vacuum environment. The corporate environment is something real complex and dynamic. There are several external factors surrounding a business and influencing it strategy and activities. The external environment of a company is called macro-environment. So every successful company need to deeply analyze and understand all macro-environmental forces in order to achieve the defined goals and objective as well as for the smooth running of a business. For this purpose company did PEST analysis. 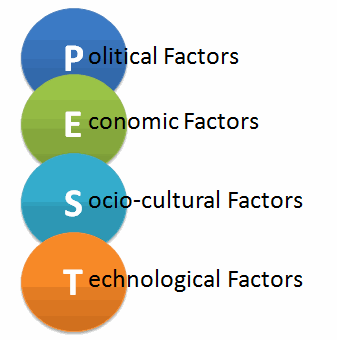 PEST Analysis is abbreviation of “Political, Economic, Social, & Technological analysis" and it allows companies to make a framework of macro-environmental factors for the purpose of designing effective environmental strategies. The political factors which influence the external company environment includes consumer protection laws, employment laws & regulations, competition regulations, environmental regulations and government taxes etc. so every business needs to operate around these forces. Example: Reduction in import duty of floor tiles for ceramic industry can have two types of impacts. It will be positive to the local ceramic manufacturer as imported tiles are more costly. However, it will leave negative impact to importers. Economic factors also influence the external environment of a particular company. It affects the purchasing power of potential customer as well as company’s cost of capital. Example: Unstable bank interest rate in a particular country affects the stability to the cost of a business. Social factors are also very important consideration for every company. Companies needs to carefully analyze the demographics, fashion & trends, leisure activities, education, living standards and lifestyle changes etc. these factors actually affects the customer wants and the size of potential markets. Technological factor is the last step of PEST analysis. These factors lower the barriers to enter, influence a company outsourcing decision and reduce minimum efficient production level. All of the above factors should be carefully analyzed. Every company should conduct a thorough PEST analysis because it enables a company to understand these external factors fully and take advantage of the existing opportunities. Furthermore, it helps a company to foresee any existing threats. So, PEST analysis is a best strategic tool which helps the company to make the right decisions by keeping in mind the ever changing external environment that surrounds the company.